A real fraudulent, pseudo, bogus and counterfeit clone! Prepare the T-SPX and the Mold-600 and have them both ready. Remove the fat from the pork and beef and dice it with the knife. Dice the backfat by hand into desired size, and then freeze it with only the pork shoulder fat (discard any beef fat). Cut the lean pork and beef into 1” dice. Combine the Instacure #2, salt, dextrose, sugar, garlic, pepper, allspice, nutmeg and ginger in a mixing bowl with the water and blend all the ingredients into a soupy mixture. Pour the mixture over the meat and toss the diced meat to coat the pieces. Place the meat into a non-reactive container, cover it, and refrigerate it overnight. About twenty minutes before grinding the meat, place it into the freezer along with the plate, grinder knife and the grinder’s throat housing. Grind the pork and beef through a 3/16” plate and into a bowl set in another bowl of ice. 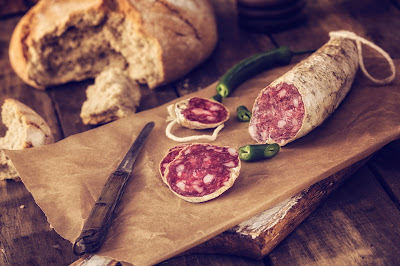 Add the T-SPX culture and mix the sausage while spraying the wine into the blend with a spritzer until it is evenly combined and the mass becomes sticky. When pulled apart, the sausage should show sticky “peaks”. Remove the bowl from the mixer and evenly fold in the frozen, diced backfat by hand. Add enough shoulder fat to equal 30% total fat with 70% lean. Finally, stuff the sausage into 61 mm. (2-3/8”) clear synthetic protein-lined fibrous casings and tie 6” links (four links per 24” casing). Spray the links with the Bactoferm™ Mold-600 solution and place them into a fermentation chamber at 68°F in 90% relative humidity, reduced to 85% after three days. Air-dry the sausage in a dry-room at 55°F (13°C) in 80% humidity for about six weeks reaching an Aw of <.85. Following the loss of 35% moisture, store the sausages at 55°F (13°C) in 75% humidity.